Pongal is an important four-days-long traditional harvest festival in India, in fact, it is the thanksgiving festival of India. Celebrated primarily in the Southern part of the country, Pongal is a festival when people worship the God, Sun, and pray for the rewards. Also known as Sankranti or Sangkranti in the Northern part of India. Among the must activities are cleaning of the full house and decoration with rangoli, and colored pattern made in floors and walls. TheHolidaySpot celebrates Pongal in its true spirit, with Happy Pongal greeting cards, traditions, how it is celebrated, recipes, wallpapers and more. Read about the fascinating history of Pongal and know how the festval got its roots. Know how Pongal is celebrated and the ways in which the festival days are observed in Tamil Nadu. 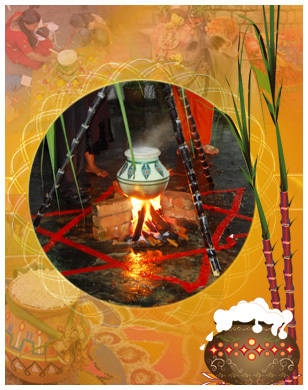 Wish "Happy Pongal" to friends and loved ones with cool e-cards related to the festival. Enhance your mood of celebration by downloading these beautiful Pongal themed screensavers. Install on your PC screen or send to dear ones exquisite, free wallpapers themed to Pongal. Cook up delicious dishes related to Pongal, including traditional ones, with our assistive cooking tips. Make your own animated Happy Pongal wishes. Share this wishes with any social media like Facebook or Whatsapp. Similar festivals as Pongal are celebrated elsewhere in India and undiminished by time. Check out! Create perfect Pongal themed Rangoli and enlighten the auspicious occasion of Pongal further.